TUNIS, Tunisia - As the lonely sound of "Taps" drifted over 2,833 bleached-white headstones Monday, dozens of U.S. Army Africa Soldiers raised their hands in salute at the North Africa American Cemetery. They were among a group of U.S. service members who traveled to the cemetery to honor the fallen, men who paid the ultimate sacrifice during the North Africa campaign in World War II. The ceremony began with a prayer and remarks from Hon. Gordon Gray, U.S. Ambassador to Tunisia. Then Gen. William E. Ward, commander, U.S. Africa Command, stepped to the podium echoing the words of Gen. Omar Bradley, who led U.S. Army II Corps in North Africa. "We are given one life. The decision is ours whether to wait for circumstances to make up our mind, or whether to act... and in acting, to live," Ward said. "Those whom we honor today certainly embody this sentiment. The results of their sacrifice live within us and in our way of life." Wreaths were laid, anthems played and salutes rendered. But the most moving part of the event followed the ceremony, when U.S. service members fanned out among the seemingly endless rows of white markers. A strong Mediterranean breeze caught the huge U.S. flag hung at half staff. 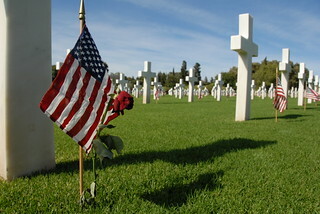 Tiny American flags next to each grave marker fluttered. Single roses, wilted from the hot Tunisian sun, marked headstones of the unknown that read, "Here rests in honored glory a comrade in arms known but to God." In all, there are 2,841 burials in the cemetery, to included 240 unknowns. Amid the graves are fountains surrounded by flowers, where Soldiers sat to contemplate those who gave the ultimate sacrifice in the defense of freedom. "This should be the first stop for any American planning to visit Tunisia," said Maj. Philip Archer, a U.S. Army Africa officer who plans the command's partnership engagements in North Africa. "This is a solemn place." For U.S. Army Africa Soldiers, the Memorial Day service was the culmination of a four-day journey through Tunisia's World War II battlefields. In late-1942, U.S. forces landed in North Africa with British troops. Their first fights were with Vichy French units, who later joined the Allied cause. Together, they pushed east into Tunisia, where they clashed with German and Italian troops among craggy, cactus-covered hills and washed out wadis. The battles that followed were retold in detail by Rick Atkinson in his book "An Army at Dawn," a historical novel that brought the ghosts of the winter of 1943 to life during U.S. Army Africa's staff ride, dubbed "Lion Torch." Maj. Gen. William B. Garrett III, commander of U.S. Army Africa and roughly 30 members of his staff made visits to places of Army legend, such as El Guettar, Longstop Hill and Kasserine Pass. They also paid respects at the resting place of French and British Commonwealth troops who died during the North African campaign. Retired Army Col. Len Fullenkamp, who guided U.S. Army Africa's staff ride, said discussions touched on the human dimension of war and the human costs of war. "When we walk through a cemetery, stop at a marker and read the name of the Soldier, you make a connection. You read out loud the date he was killed and make a connection with a particular battle," Fullenkamp said. "But there's also a silent communication between the Soldier living and Soldier dead that is so powerful it reduces grown men to tears." Col. Bill Phillips, U.S. Army Africa's chaplain, walked along the 364-foot limestone wall listing the 3,724 names of those whose remains were buried at sea or never found. "There are more lost and unknown than there are headstones here," Phillips said. "That really hit me." Phillips also thought of his visit to Hill 609, where the 34th Infantry Division fought in the final days of combat in Tunisia. "We stood at the foot of the hill looking up, thinking about how they fought their way to the top, now we are here where many of them are laid to rest," Phillips said. "It's overwhelming." Nearby, Sheila Perks, a Wisconsin-native whose husband works in Tunisia, walked with her daughters Holly, 6, and Lauren, 4. The girls curiously ducked between headstones, asking questions about the men who died. They wondered why the grave marker of Pvt. Nicholas Minue has a gold star and gold lettering. Minue, a 1st Armored Division Soldier, was awarded the Medal of Honor after braving machine gun fire to charge the enemy with a fixed bayonet. Perks, who thought it was important to bring children to such a place, especially on Memorial Day, spoke to the girls in a way anyone could understand. "I explained to them, this is why we have our freedom," Perks said. "These men did not die for you, they lived for you." Single roses marked the graves of the unknown on May 31 during Memorial Day events at the North Africa American Cemetery and Memorial near Carthage, Tunisia. Photo by Rick Scavetta, U.S. Army Africa.